During the fall, a good pot roast is a great comforting dish to enjoy. Since it's Oktoberfest season, I wanted to attempt a traditional Sauerbraten, which is a German style pot roast. The roast is marinated in a combination of cider and red vinegar, along with water and a few spices. Traditionally, juniper berries are used in making this dish. I didn't get a chance to pick any up at my local spice shop but even without the juniper berries, the dish was delicious! The roast marinates for 2-3 days (I marinated for 2) and then sugar is added to both the marinade and meat. It's then pressure cooked and the results were amazing! Once the roast has pressure cooked, the marinade is strained and then placed back into the Instant Pot to create the gravy. It's such a acidic mixture that to balance it out, some sugar and spices are needed. What was interesting about making a gravy from the marinade is the addition of powdered gingersnap cookies. After it boiled a bit, a gorgeous, thick and rich gravy was made and perfectly complimented the roast. Press SAUTE and combine the water, cider vinegar, red wine vinegar, onion, carrot, salt, pepper, bay leaves, cloves, and ground mustard. Bring to a boil, then lower the heat and transfer to another container to cool. Pat the bottom round dry and rub with vegetable oil and salt on all sides. In the now empty IP, press SAUTE. Once hot, add the meat and brown on all sides, approximately 2 to 3 minutes per side. Turn off IP and add the cooled marinade into the IP over the beef. Remove the filled IP insert, cover and place into the refrigerator for 3 days. If the meat is not completely submerged in the liquid, turn it over once a day. After 3 days of marinating, return the filled IP insert to the IP and add sugar. When the IP beeps after pressure cooking for 60 minutes, allow your IP to naturally release pressure for 20 minutes. While naturally releasing pressure (also known as NPR or NR), the display will reflect numbers counting up from 1. The numbers indicate how many minutes the IP has stopped cooking since it beeped (or how many minutes it has been naturally releasing pressure). No need to touch your IP while it naturally releases pressure. The pin at the top of your IP will drop when all pressure has been released and it's safe to open. Remove the meat from the IP and keep warm. Strain the liquid to remove the solids. Press SAUTE and return the liquid to the empty IP pot and place over medium-high heat. Whisk in the gingersnaps and cook until thickened, stirring occasionally. Strain the sauce through a fine mesh sieve to remove any lumps. Slice the meat and serve with the sauce. 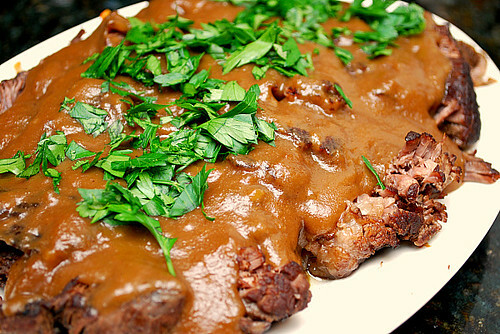 Sauerbraten is an amazing dish and well worth the three day marinating! I haven't made Sauerbraten since the early 1980s but remember how great it tastes! Thank you for the recipe, especially for the Instant Pot. Is there a ginger snap brand that you like for this recipe? Here are brands I've used in the past for this recipe that worked well!